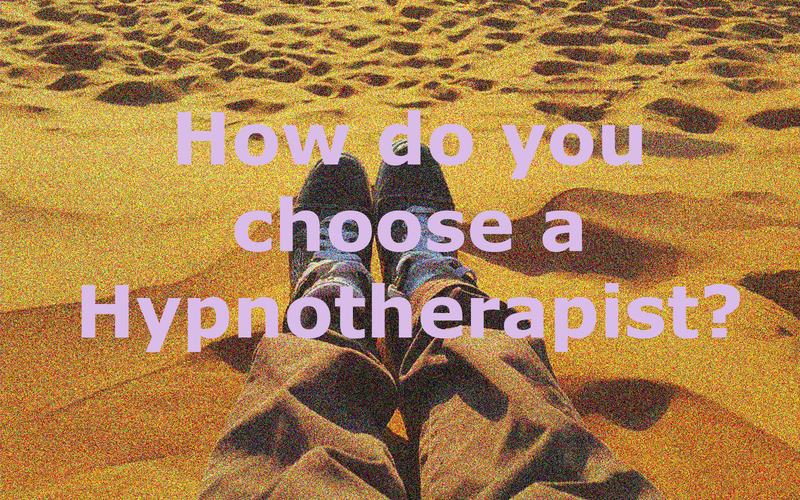 How do you choose a Hypnotherapist? As a Hypnotherapist in private practice, as you can imagine, I tend to keep an eye on what is happening in my own area; whether there are any new Hypnotherapists, their methods and what they are saying on their websites. In business terms, these are my competition, although I personally feel that, as more people begin to realise the power of hypnotherapy to produce results, and fast, there are plenty enough clients to go round. Recently though, I’ve begun to notice some fairly aggressive marketing online, undercurrents of putting down the ‘competition’, and this led me to wonder, if I was looking for a Hypnotherapist, how would I know how to choose one? Obviously, the first question is, are they qualified? Once you start looking you will find a range of qualifications such as Dip.Hyp. (Diploma in Hypnotherapy), DCH (Diploma in Clinical Hypnotherapy)or HPD (Hypnotherapy Practitioner Diploma), one is not ‘higher’ than the other and they generally just tell you which school or methodology they have been trained in. In the UK there are, by law, no minimum standards required to qualify as a Hypnotherapist, so a qualification may mean, on its own, very little. There are also those that use qualifications that are somewhat misleading. If they are showing a BSc or MSc it is unlikely to be in Hypnotherapy, and may be totally unrelated. There are only a handful of Hypnotherapists qualified to that level in hypnosis as they are fairly new qualifications. The first person in the world to gain an MSc in Hypnosis was Matt Jacobs, only a couple of years ago (and one of the visiting lecturers on the MSc in Clinical Hypnotherapy that I am studying). If these qualifications are related they will be making a point of telling you. There are a variety of professional bodies to which properly qualified Hypnotherapists can join. These various bodies have their own criteria for acceptance; those that only admit ‘healthcare professionals’ (doctors, dentists etc.) such as British Society of Clinical and Academic Hypnosis (BSCAH), those that demand a specific level of training, such as the General Hypnotherapy Standards Council (GHSC) and a few which are little more than umbrella organisations for affiliated schools. The GHSC is currently the largest professional body in the UK and its training level is quite stringent, it also demands that all its members continue their professional development. There is also a government body, the Complementary and Natural Healthcare Council which suitably qualified Hypnotherapists can belong to, although many (myself included) do not wish to join as we consider that hypnotherapy is not a ‘complementary’ therapy (a word often used interchangeably with ‘alternative’) and that other therapies registered by them have little or no evidence base for their practice. So, yes, check their qualification and if they belong to one of the professional bodies, check the criteria for training and membership. Almost all demand Continual Professional Development so they should be showing some updating of their skills, especially if they’ve been practising for many years. Often you will see Hypnotherapists claiming that you can feel assured that they are ‘fully insured’. Yes, absolutely they should be, but I would think it is highly unlikely that anyone would set up in any business these days without being fully insured! Longevity…does being in the business for 15 or 20 years actually mean anything? It may. When I had been working as a Hypnotherapist for about 5yrs I met someone who, rather snootily, said that they had been doing it for 20yrs. I later discovered that this person only worked (very) part time as a Hypnotherapist and had possibly seen less clients in that 20yrs than I had already seen in my 5yrs. Beware those that can only see you in the evenings or at weekends (that doesn’t mean dismiss them out of hand, they may just be winding down after a long career!). Also, don’t assume, because they have their practice in healthcare establishments that they are better qualified, some of these places hire out consulting rooms just as they’ll charge you for parking. Finally, there are different methodologies in Hypnotherapy: Traditional (or Suggestion) Hypnotherapists, Regression Therapists, Solution Focused, Ericksonian, Cognitive Hypnotherapists, Hypnoanalysis etc. Many Hypnotherapists can be protective about their own ethos, and even sometimes imply that there is something wrong with that of others; however it is really about your preference. My own view is that they all have something slightly different to offer, which is why I have chosen to become qualified in various modalities; Traditional, Regression and Ericksonian and work with other methods, depending on the requirements of the client. To that end I use the description ‘Client Centred’. Perhaps I’ve made it sound like a bit of a minefield finding the right Hypnotherapist for you but, in the final analysis, almost all will give you a free first consultation so that you can meet them face to face and gain an understanding of how they work and whether they feel right for you. These free consultations can give you the chance to ask them about their qualifications and experience. Don’t feel embarrassed or guilty asking – it’s your money and your health.